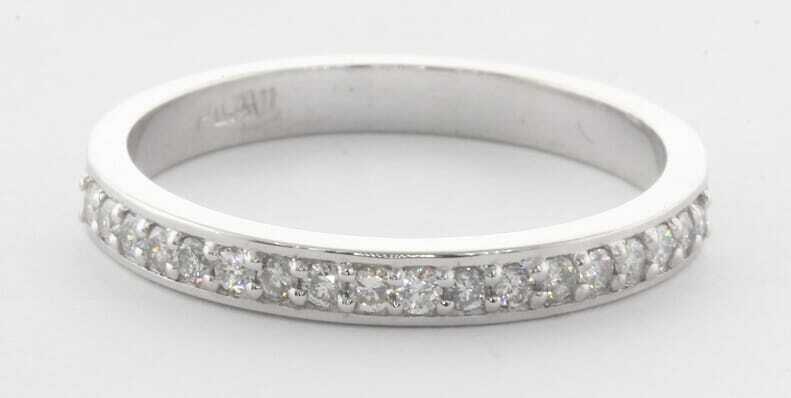 This stunning platinum diamond wedding band was made as matching wedding ring in Nov. 2014. The ring was made in high quality platinum and was set with 18 round brilliant diamonds. All diamonds are very white and clean diamonds - G in colour and VS2 clarity. The ring total carat weight is 0.20 carat. The ring can also be made in white gold or yellow gold. It can be used as matching wedding ring for a plain engagement ring(solitaire) or a diamond engagement ring. This ring will also look very nice by itself as a diamond ring.